This article deals with Central City as an area in Sonic Battle. For more about the city's role in other games and as a storyline location, see Central City. 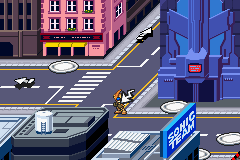 Central City is the third overworld area visited in Sonic Battle for the Game Boy Advance. An urban metropolis of office blocks and high-rise apartment buildings, this downtown area is flanked by the Emerald Town suburbs and the gambling district of Night Babylon. Tails initially brings Emerl here to make use of the analytical facilities at Central Lab. Seemingly forgetful or unappreciative of Tails' previous contributions to the survival of the free world, security turns the fox away at the door. 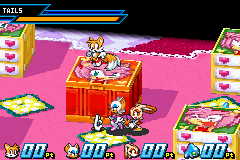 Rouge pops up to offer Tails and Emerl her access pass; and while wisely suspicious, Tails fried his own computers in Emerald Town while trying to analyse Emerl, so he isn't in a position to turn it down. Inside the lab, Tails mistakenly accesses classified government files about Professor Gerald's research on Emerl 50 years ago. 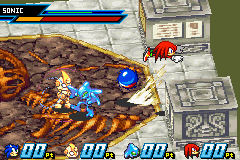 Guard Robos rush in to detain Tails and Emerl, and the pair have to fight their way out of the city. Due to the non-linear nature of Sonic Battle's stages, other characters return to Central City in their own episodes. Amy's apartment is in the area, and her episode begins by training there with Cream and Emerl. Central City also houses the in-game offices of Sonic Team, where passwords can be entered to unlock secret skill cards. Immediatly after entering downtown Central City, Tails and Emerl are ambushed at the crossing by E-121 Phis. 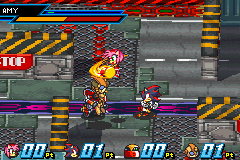 Later on, Battle Highway becomes Shadow's preferred training arena. The interior of Central Lab seems to be attached to a natural history museum, given that it has a T-rex skeleton embedded in the floor. Cream's fight training is conducted here. Amy's Room is a sprawling testament to the colour pink, although blue pops up as well in the form of heart-framed Sonics embroided into the carpet. Most arenas are square, but this is rectangular-shaped.